I haven’t really done much this February. Most of my time has been spent on my new job as a teaching assistant. It took me a while to get use to working every day as I use to be a part time worker. The people at my new work place are very friendly and welcoming people. Everywhere I go, people say hello and ask me how I’m doing. I must have the same conversation three or four times. I bet the others go through the same convo cycle. I find it a little tedious, but I try to remember that it’s the first time having that conversation with that person. I think this is what celebrities feel like when they are asked the same question in press junkets. I try to remember what people say to me too and inquire about their lives as well. I’m totally anti-social, I do like my colleagues and care about them. I really value the weekend now and love Fridays! 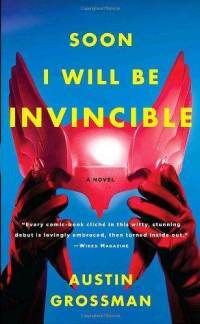 In my downtime I have been reading Soon I will be Invincible by Austin Grossman. It’s one of the books on my ‘to be read’ pile since 2011! It is a book about superheroes and alternates between the villain’s point of view and the perspective of the hero. Jon Bear has read it before, you can read his review here. I’ve also been watching Star Trek Discovery on Netflix. It’s different from the other Star Trek series. The main character is Michael Burnham (Sonequa Martin-Green) as a science specialist on the USS Discovery. It features the Federation during war time and the ship has a secret weapon which hasn’t been seen on Star Trek before.